Here is a snippet from the Tameside Reporter detailing the 11 stone 4 loss by local bus driver Robert Thorndike. We did a local charity event, and the guys who came from the paper were shocked at the results we were getting and wanted to know the magic formula. When Robert started exercising with Zam at 360 Fitness, he has never exercised before. His weight has ballooned up to over 28 stone, was on medication for his weight and blood pressure, with a 60 inch waist and no physical fitness at all. Robert would try to get the gym twice a week to exercise with his trainer Zam, but used to cancel and make excuses because he has no fitness and would find it difficult to commit. He wanted to do it, but wasn’t putting 100 percent in. After complaining in a session, Zam sat Robert down and he made him realise that he has to believe in himself and put maximum effort and anything is possible. 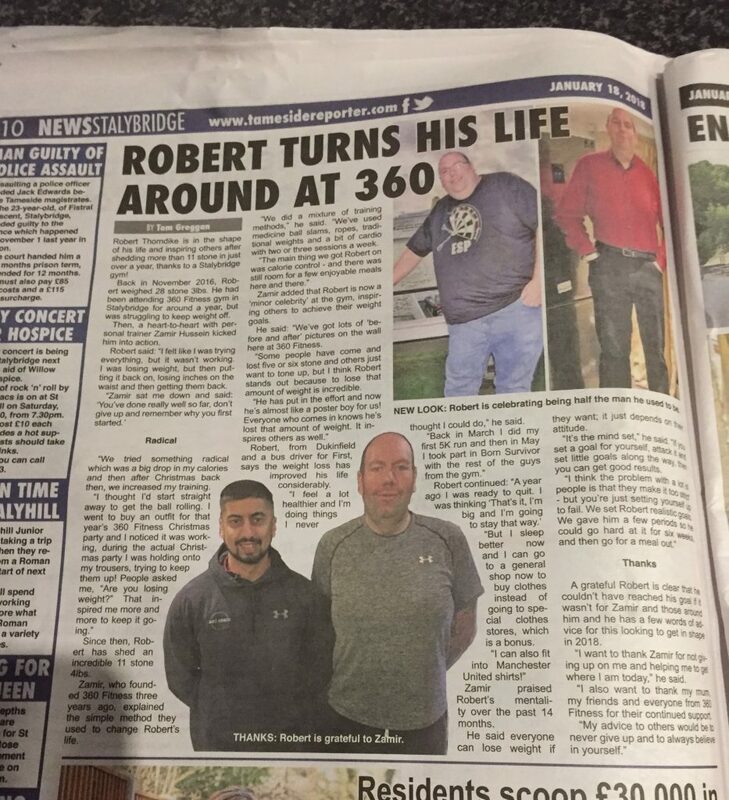 Our job at 360 Fitness is to help people, Robert felt in the past others were quick to laugh at him, and once he realised what we are like and want to help. He was ready to succeed. From December 2016 to December 2017 Robert lost 11 stone and 4 pounds and as you can see in the pictures below, completely changed his body and life. Came off the blood pressure pills, dropped over 25 inches from his body, and even completed a marathon event with the gym. So how did he achieve this? This were no fad dieting during this period. He was set some target calories to hit each day. The aim was to eat 80 percent of his diet with nutritious foods. With the main point to hit his protein target each day, as protein is the key macronutrient for fat loss and maintaining muscle. He has to send his diet to Zam every day, or face a brutal exercise as punishment in the gym for not sending it! If it sounds simple, good. It was really simple. For the exercise he was trained 2-3 times a week with our unique training at 360 Fitness. Different workouts including traditional weights, hitting tyres, slamming medicine balls down and his own bodyweight. Thats how he did it! So if you have some weight to lose, and need to tone up, what are you waiting for?